Now that tourists are scarce and the leaves begin to fall, it suits me to visit the Tower of London and study the graffiti. The austere stone structures of this ancient fortress by the river reassert their grim dignity in Autumn when the crowd-borne hubbub subsides, and quiet consideration of the sombre texts graven there becomes possible. Some are bold and graceful, others are spidery and maladroit, yet every one represents an attempt by their creators to renegotiate the nature of their existence. Many are by those who would otherwise be forgotten if they had not possessed a powerful need to record their being, unwilling to let themselves slide irrevocably into obscurity and be lost forever. For those faced with interminable days, painstaking carving in stone served to mark time, and to assert identity and belief. Every mark here is a testimony to the power of human will, and they speak across the ages as tokens of brave defiance and the refusal to be cowed by tyranny. 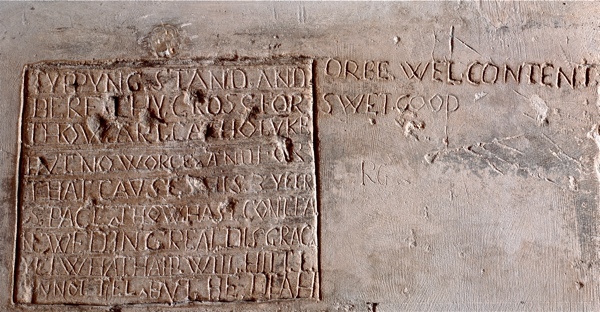 “The more affliction we endure for Christ in this world, the more glory we shall get with Christ in the world to come.” This inscription in Latin was carved above the chimney breast in the Beauchamp Tower by Philip Howard, Earl of Arundel in 1587. His father was executed in 1572 for treason and, in 1585, Howard was arrested and charged with being a Catholic, spending the rest of his life at the Tower where he died in 1595. 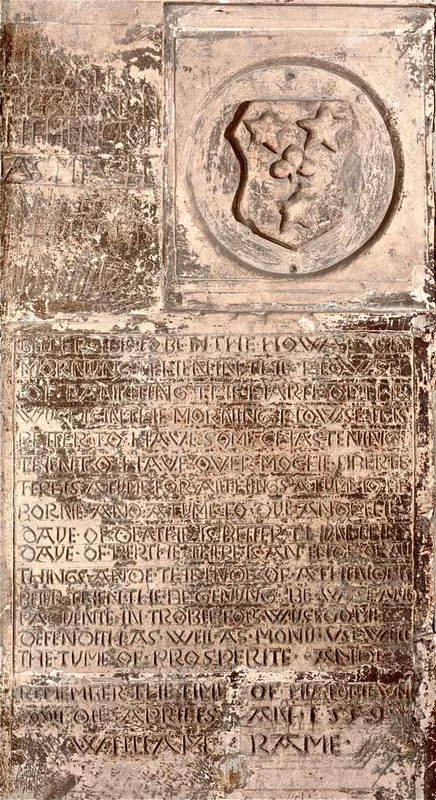 Sent to the Tower in 1560, Hew Draper was a Bristol innkeeper accused of sorcery. 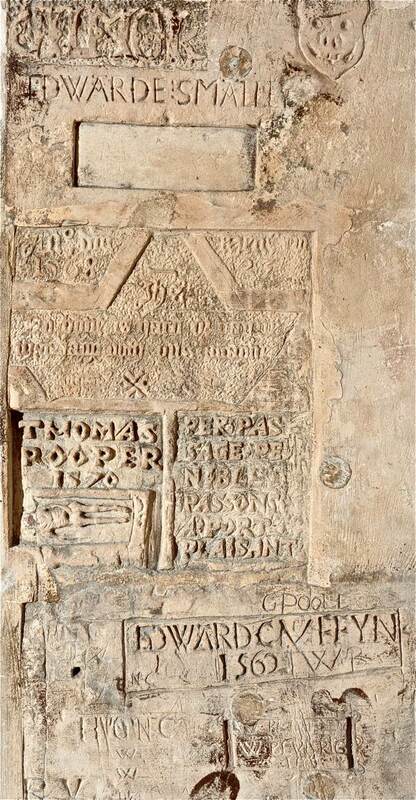 He pleaded not guilty yet set about carving this mysterious chart upon the wall of his cell in the Salt Tower with the inscription HEW DRAPER OF BRISTOW (Bristol) MADE THIS SPEER THE 30 DAYE OF MAYE, 1561. 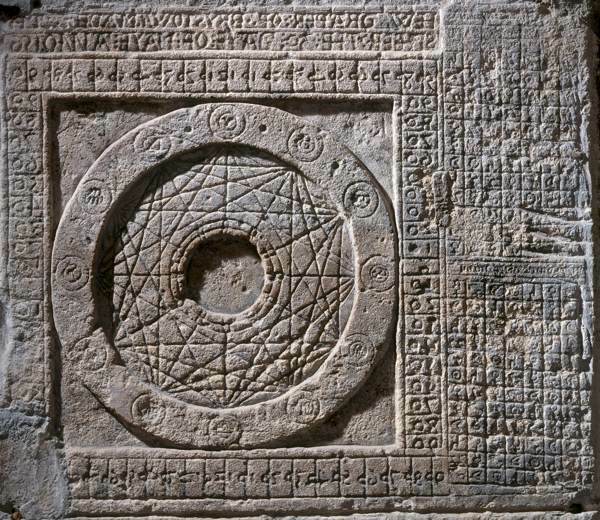 It is a zodiac wheel, with a plan of the days of the week and hours of the day to the right. 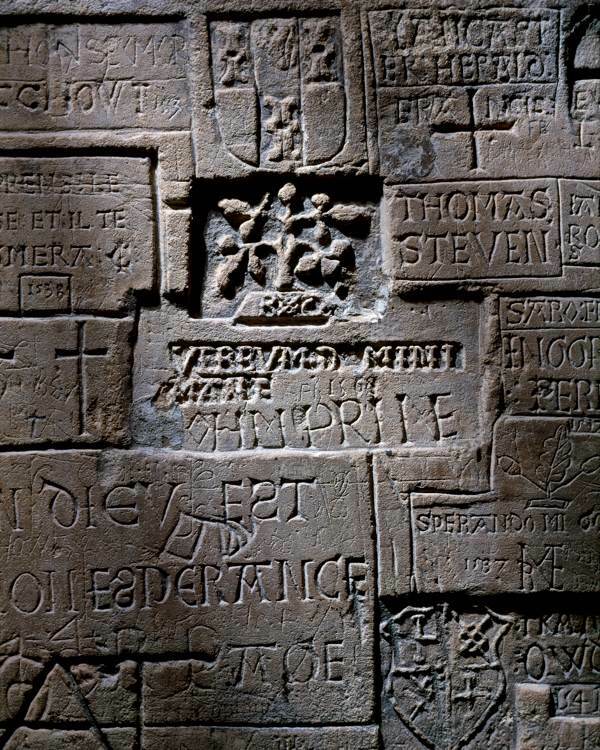 Yet time was running out for Hew even as he carved this defiant piece of cosmology upon the wall of his cell, because he was noted as “verie sick” and it is low upon the wall, as if done by a man sitting on the floor. 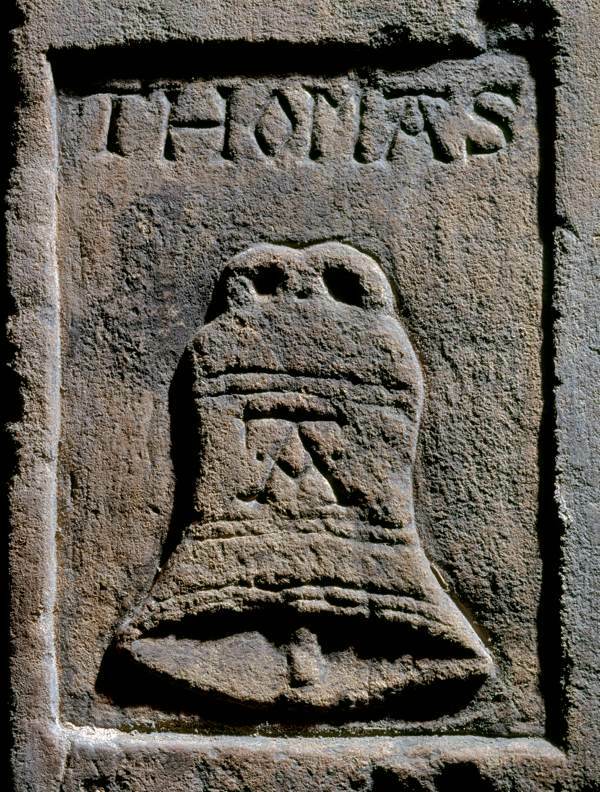 The rebus of Thomas Abel. Chaplain to Katherine of Aragon, Abel took the Queen’s side against Henry VIII and refused to change his position when Henry married Anne Boleyn. Imprisoned in 1533, he wrote to Thomas Cromwell in 1537, “I have now been in close prison three years and a quarter come Easter,” and begged “to lie in some house upon the Green.”After five and half years imprisoned at the Tower, Abel was hung, drawn and quartered at Smithfield in 1540. 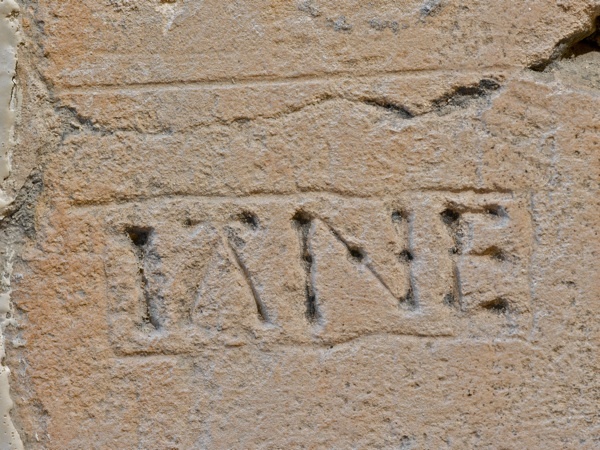 Both inscriptions, above and below, have been ascribed to Lady Jane Grey, yet it is more likely that she was not committed to a cell but confined within domestic quarters at the Tower, on account of her rank. These may be the result of nineteenth century whimsy. JOHN DUDLE – YOU THAT THESE BEASTS DO WEL BEHOLD AND SE, MAY DEME WITH EASE WHEREFORE HERE MADE THEY BE, WITH BORDERS EKE WHEREIN (THERE MAY BE FOUND) 4 BROTHERS NAMES WHO LIST TO SERCHE THE GROUNDE. 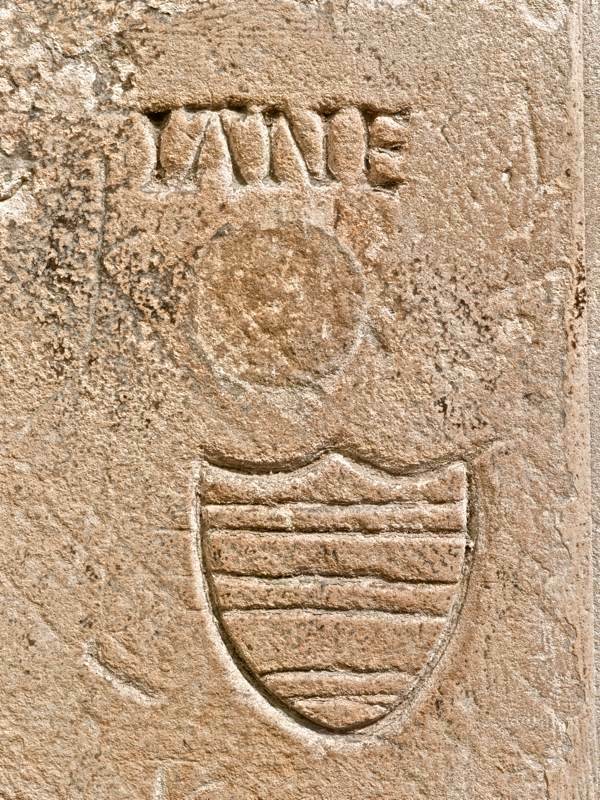 The flowers around the Dudley family arms represent the names of the four brothers who were imprisoned in the Tower between 1553-4 , as result of the attempt by their father to put Lady Jane Grey upon the throne. 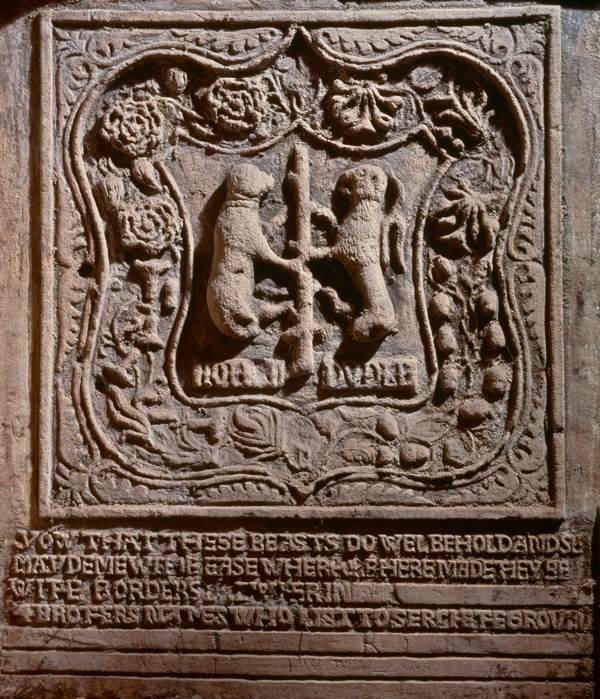 The roses are for Ambrose, carnations (known as gillyflowers) for Guildford, oak leaves for Robert – from robur, Latin for oak – and honeysuckle for Henry. All four were condemned as traitors in 1553, but after the execution of Guildford they were pardoned and released. John died ten days after release and Henry was killed at the seige of San Quentin in 1557 while Ambrose became Queen Elizabeth’s Master of the Ordinance and Robert became her favourite, granted the title of Earl of Leicester. Edward Smalley was the servant of a Member of Parliament who was imprisoned for one month for non-payment of a fine for assault in 1576. Thomas Rooper, 1570, may have been a member of the Roper family into which Thomas More’s daughter married, believed to be enemies of Queen Elizabeth. Edward Cuffyn faced trial in 1568 accused of conspiracy against Elizabeth and passed out his days at the Tower. BY TORTURE STRANGE MY TROUTH WAS TRIED YET OF MY LIBERTIE DENIED THEREFORE RESON HATH ME PERSWADYD PASYENS MUST BE YMB RASYD THOGH HARD FORTUN CHASYTH ME WYTH SMART YET PASEYNS SHALL PREVAIL – this anonymous incsription in the Bell Tower is one of several attributed to Thomas Miagh, an Irishman who was committed to the Tower in 1581 for leading rebellion against Elizabeth in his homeland. 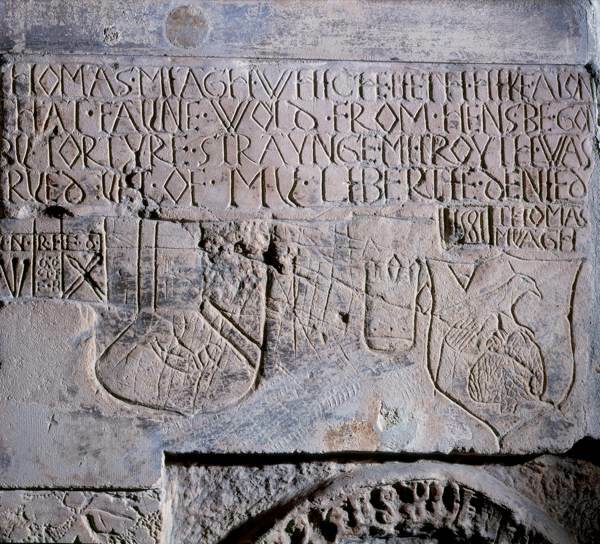 This inscription signed Thomas Miagh 1581 is in the Beauchamp Tower. THOMAS MIAGH – WHICH LETH HERE THAT FAYNE WOLD FROM HENS BE GON BY TORTURE STRAUNGE MI TROUTH WAS TRYED YET OF MY LIBERTY DENIED. Never brought to trail, he was imprisoned until 1583, yet allowed “the liberty of the Tower” which meant he could move freely within the precincts. 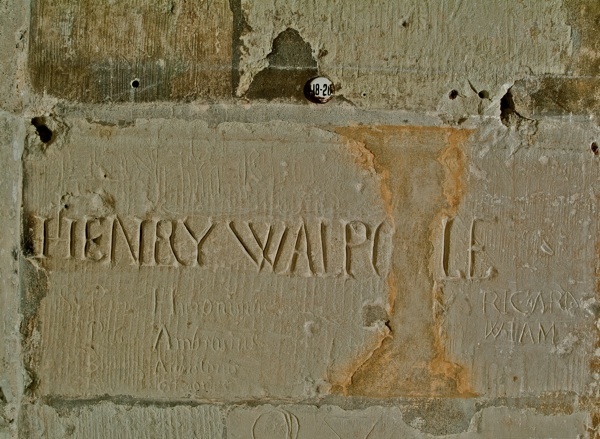 Subjected to the manacles fourteen times in 1594, Jesuit priest Henry Walpole incised his name in the wall of the Beauchamp Tower and beneath he carved the names of St Peter and St Paul, along with Jerome, Ambrose, Augustine and Gregory – the four great doctors of the Eastern church. 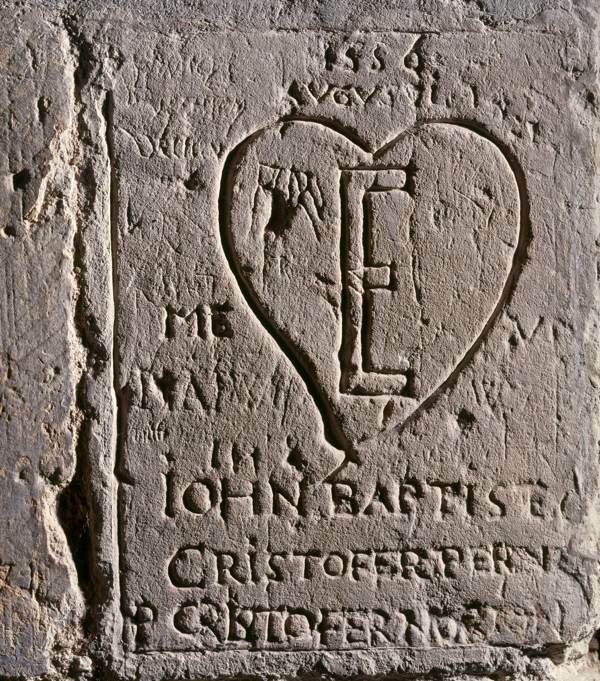 In this graffito in the Salt Towerr, the “E” in the heart stands for Elizabeth. Giovanni Battista Castiglione, Italian tutor to Queen Elizabeth. JAMES TYPPING. STAND (OR BE WEL CONTENT) BEAR THY CROSS, FOR THOU ART (SWEET GOOD) CATHOLIC BUT NO WORSE AND FOR THAT CAUSE, THIS 3 YEAR SPACE, THOW HAS CONTINUED IN GREAT DISGRACE, YET WHAT HAPP WILL IT? I CANNOT TELL BUT BE DEATH. Arrested in 1586 as part of the Babington Conpiracy, Typping was tortured, yet later released in 1590 on agreeing to conform his religion. 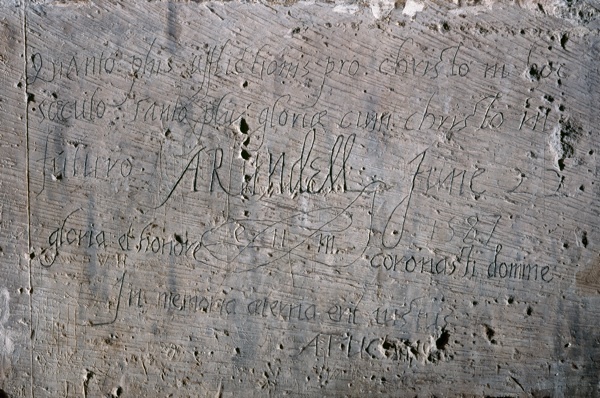 This inscription is in the Beauchamp Tower. T. Salmon, 1622. Above his coat of arms, he scrawled, CLOSE PRISONER 32 WEEKS, 224 DAYS, 5376 HOURS. He is believed to have died in custody. 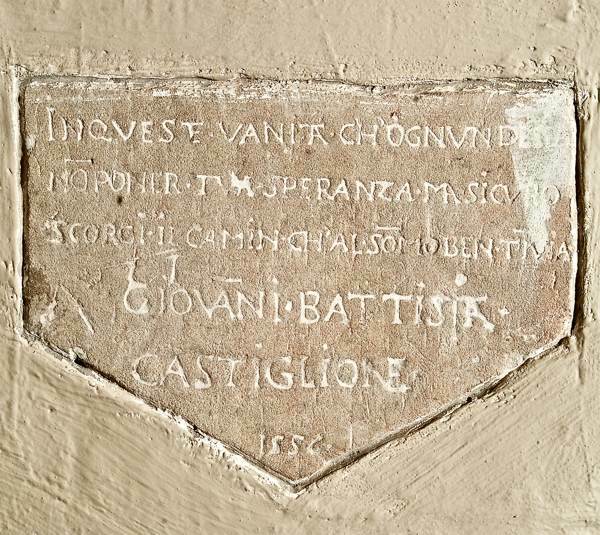 A second graffito by Giovanni Battista Castiglione, imprisoned in 1556 by Elizabeth’s sister, Mary, for plotting against her and later released. 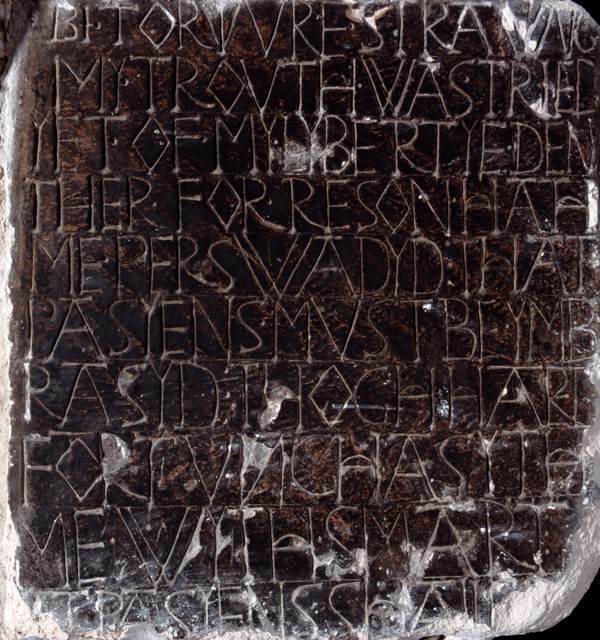 Nothing is known of William Rame whose name is at the base of this inscription. BETTER IT IS TO BE IN THE HOUSE OF MOURNING THAN IN THE HOUSE OF BANQUETING. THE HEART OF THE WISE IS IN THE MOURNING HOUSE. IT IS MUCH BETTER TO HAVE SOME CHASTENING THAN TO HAVE OVERMUCH LIBERTY. THERE IS A TIME FOR ALL THINGS, A TIME TO BE BORN AND A TIME TO DIE, AND THE DAY OF DEATH IS BETTER THAN THE DAY OF BIRTH. THERE IS AN END TO ALL THINGS AND THE END OF A THING IS BETTER THAN THE BEGINNING, BE WISE AND PATIENT IN TROUBLE FOR WISDOM DEFENDETH AS WELL AS MONEY. USE WELL THE TIME OF PROSPERITY AND REMBER THE TIME OF MISFORTUNE – 25 APRIL 1559. 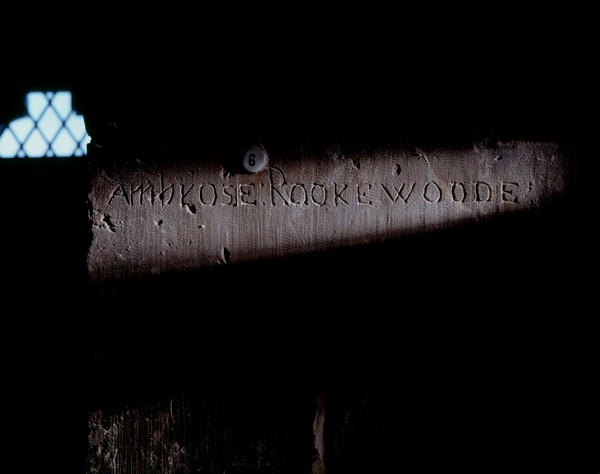 Ambrose Rookwood was one of the Gunpowder Plotters. He was arrested on 8th November 1606 and taken from the Tower on 27th January 1607 to Westminster Hall where he pleaded guilty. On 30th January, he was tied to a hurdle and dragged by horse from the Tower to Westminster before being hung, drawn and quartered with his fellow conspirators. So much information ! Extraordinary ! Thank you. Fascinating. You have significantly altered my morning routine today! Fascinating. I am intrigued by the variety and quality of the letterforms and wonder what tools were available to them. As prisoners, it is surprising that they were allowed access to sharp implements. 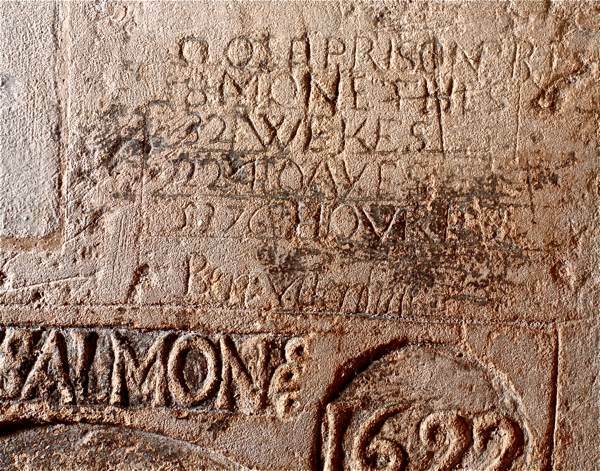 Of all graffiti, that in the Tower seems to speak most loudly down the ages. Perhaps it is because so much is known of the lives -and deaths- of those involuntary scribes who languished at the very centre of our national story. It amazes me the elaborate scale of some, like the Arundel family crest I almost visualise the brothers standing posed around a chimney breast,moire ting their footman to chisel deeper the gillyflower ! Others it is easy to see a man in his final days on earth, scraping listlessly with the handle of his one spoon, to leave some sign of his passing, for those awaiting similar fate in future. Amazing too, that Tower guardians allowed such marks to remain and in effect grant some life after death to those whom the Monarch disliked so much. I like to think these poor unfortunates would draw comfort in knowing that 500 years later, so many people draw such interest from their final works. I still have this copy today and some extra copies of various rubbings that I made and it got me very interested in the history of these prisoners, so I did a lot of research in tower archives and through various historians and managed to find out more than had been published. Superior graffiti indeed. There is often bits and pieces in old buildings but I guess the Tower of London had more than its fair share of educated men (and occasionally women) who had plenty of time on their hands. The only place with comparable quality I have seen was in the Lantern Tower in La Rochelle which held English prisoners.